I read the book also because I was given a copy for Christmas. Since I love to read biographies, and English history interests me, I read the book also, and I was not disappointed. Matthew Henry was a Puritan Dissenter known for his piety and writing though he was a pastor of two small churches all of his life. He was raised in a strict religious home where he was taught daily family worship, even conducting the family devotions much of the time. As Henry grew older and more experienced, he was in great demand as a speaker and writer, and, as most men of that sort, suffered in his health because of it. He died at only 52 years old. The two sections that I thoroughly enjoyed and would recommend to anyone for reading were the section on knowing God’s will as he went through an agonizing process of leaving his long-time congregation in Chester and moving to another congregation in Hackney, closer to London. The author gives four pages to Henry’s own words as he lists 11 factors in determining God’s will. The other section I enjoyed was on his sermon preparation and manner of delivery. 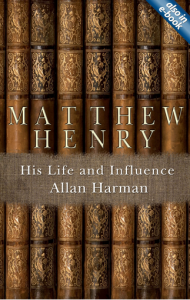 Matthew Henry has often been viewed as more of a lighter commentator (which was a purposed style to serve the average Christian, not the scholars of his day). His sermon delivery, however, was more typical of the Puritan style, a style copied by Spurgeon also—not bad company when it comes to preaching. Some might call the style topical, but I would describe it as a more thorough treatment of a smaller part of the text. Usually the sermon was an extensive exposition on just one verse. I still use my Matthew Henry six-volume commentary. This encouraging biography will make me appreciate it even more.